Strike! The Tour that Died of Shame is the sixth in Scratching Shed Publishing’s critically-acclaimed Rugby League Classics series. 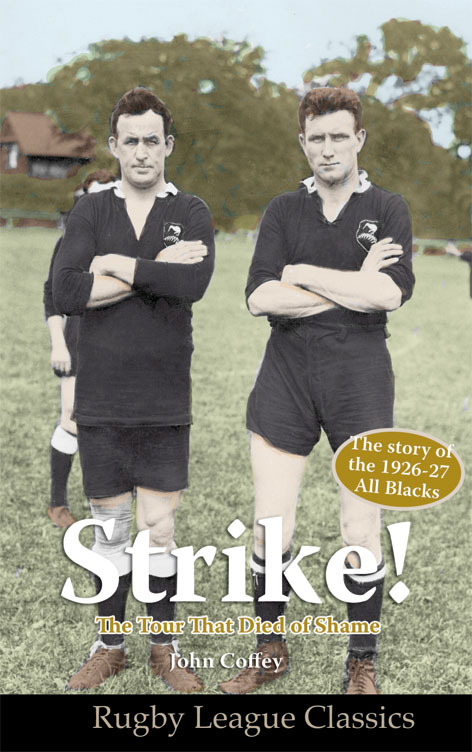 The 1926-27 New Zealand ‘All Blacks’ rugby league tour of Great Britain was the most tempestuous sporting venture of all time and led to seven of the players being disqualified for life on their return home. Set against the backdrop of a financially crippling miners’ strike, the ‘guilty’ tourists rebelled against their controversial coach, an Australian who himself was suspended for part of the tour by English authorities. Nineteen loyal players were left to carry on bravely against overwhelming odds in the midst of a harsh English winter, some of them backing up for as many as fifteen consecutive matches. Strike! The Tour that Died of Shame is that story. It is a tale of hardship and heroism, courage and cover-up, examined in depth for the very first time. It is an investigation of what went wrong with a tour that promised so much. It seeks to establish who - if anyone - was really to blame. And it is a fascinating slice of sporting social history whose reverberations continue to be felt to this day. John Coffey is New Zealand’s most experienced rugby league writer, having covered more than 100 Test matches during 44 years with The Press newspaper in Christchurch and as a touring New Zealand Press Association correspondent. 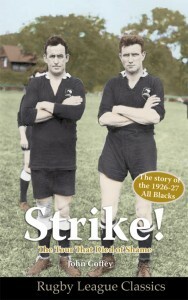 His previous books have included Canterbury XIII (1987), Modern Rugby League Greats (1991), Being Frank, the Frank Endacott Story (2002), and major publications to mark the centenaries of the Kiwis (2007), New Zealand Maori Rugby League (2008) and Auckland Rugby League (2009).